One year ago today, Elissa Bjeletich sent me a message that began what has been a life-changing adventure. We were acquainted as online friends, and had met once in person, just a few weeks before she sent the message, when she spoke at a local parish. I was a great admirer of her podcasts and books, and I remember being so delighted to have the chance to meet her in person. I certainly never expected anything to come of that meeting. When she contacted me on January 15th, 2018, it took me a minute to wrap my brain around the invitation. It went something like this: “I’m thinking about doing a daily podcast for families for Great Lent. Do you want to help me? It’ll be a bit of an endeavor, but we could do it!” I responded that I would need a few days to consider, but how could I pass up this chance to work with Elissa and learn from her? Within those few days, I agreed to help, and we got to work. I don’t think either of us truly knew what all it would entail. In 2018, Great Lent began on February 18. If you do the math, you’ll see that we had about a month to select a title for our project, approach Ancient Faith Radio to see if they would be willing to host it, build a website, and write and record 50 podcasts (or as many of them as possible). Not too far into the project, we realized it would be a good idea to post similar content on two levels: one written for older children, and the other geared at younger children. So it was that we decided to create each day’s podcast and then write a simplified version for younger children. This doubled our podcast number, stretching it to 100 episodes! We worked together to figure out what direction to go each week, then Elissa did most of the writing for the main posts, and I simplified them for the younger children. We decided to split the recording: she recorded the older kids’ version, and I recorded the younger. We ate, breathed, and lived “Tending the Garden of Our Hearts” for those weeks. And by the grace of God (and thanks to great help from our families who picked up some of our chores so that we could concentrate on this project), we had the first three weeks’ worth of posts ready to roll before Great Lent even began. This was helpful because it meant that we would not have to do daily writing during Lent. Instead, we could continue to work ahead as we were able throughout the busy Lenten season. Thanks be to God, we had everything ready on time, finishing our last productions before Holy Week even rolled around. Both Elissa and I felt that we had already been in Great Lent for weeks when it began, and what a joy it was to experience in real time the events that we had written and recorded about weeks before! We felt more acutely cognizant of what we were experiencing as it happened. This brought us great joy. We learned so much about the Scriptures, saints, and theology about which we wrote. Deeper than the knowledge gained by a quick read, the ideas and stories with which we wrestled to try to get the wording just right for children sank into our souls. And the learning continues. For example, at my desk, I still have the picture of Elder Dobri that I printed just days after his passing as we were preparing to write about his life. I keep the picture there to remind me to ask him for his prayers, and to be encouraged by the love emanating from his smile. Another example: at church when I see the incense wafting in the sunlight, I now think about our incense episodes and how it is a visual and olfactory reminder of our prayers rising and of the Holy Spirit’s presence in that place. So many times Elissa and I have said to each other that even if all of this work only reached us, aiding in our salvation, it is so worth it. But from time to time we have heard from others that it has been an encouragement or a help to them and their family as well, and we are heartened by this news. When Great Lent came to an end, we did not feel that the project was finished. We enjoy working together, and learning and helping families to grow together, so we decided to continue on with a regular podcast. Ancient Faith was kind enough to agree to host it, so we began our weekly podcast in May of 2018. We are grateful for this opportunity. 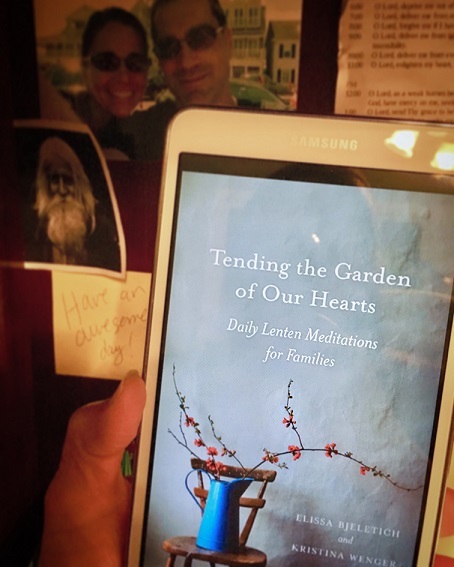 And now, less than a year after we finished writing them, our Lenten series will be published by Ancient Faith Publishing as Tending the Garden of Our Hearts: Daily Lenten Meditations for Families. This book is a re-write of the older children’s version on which we based the podcast series. It will also be released as an audiobook, voiced by both of us, for those who would rather listen than read. Because it would have made the book frighteningly long, we did not include the younger children’s version in the book. To help families with younger children who are not yet ready for the book, that version remains available as a podcast here: https://tending-the-garden.com/the-lenten-series/. We hope that this book will continue to help families grow together towards Christ throughout the Lenten season. I never would have guessed that Elissa and I would work together like this. I also did not expect that we would work so hard and so long on a project and yet come away from it feeling that we’ve gained so much. Had I known, when I received it a year ago, what all Elissa’s message would have entailed, I’d have said yes on the spot, without thinking about it for a few days. The challenges, learning, and friendship that have bloomed through this project will continue to grow, and to grow me, and for that I am truly grateful. May the Lord bless each reader and strengthen them to diligently tend the garden of their heart. Kristina Wenger is a mom of two who enjoys interacting with little people. She is an educator who has taught first grade and Sunday church school, homeschooled, and co-founded an educational organization. She works part time for the Antiochian Orthodox Department of Christian Education, managing several of their media ministries and writing curriculum. She is also a storyteller who voices some of Ancient Faith’s audiobooks as well as the Let Us Attend and Tending the Garden podcasts. Kristina and her husband have two grown children and are members of St. John Chrysostom Church, York, PA. This book is lovely. It has truly enriched our lives this lenten season!